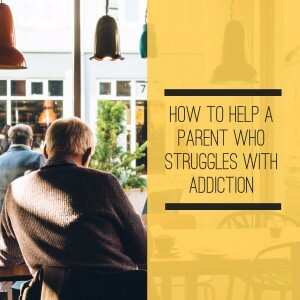 Watching a loved one battle addiction is never easy, but having a parent who struggles with substance abuse presents unique challenges. You must balance the desire to see your father or mother get help with the need to address how parental addiction has affected your own mental health. In many families, addiction is a secret that everyone knows and nobody acknowledges. Children grow up knowing that their parent abuses drugs or alcohol, but not fully understanding how to change the situation. However, it’s possible for an addiction to develop so gradually that you might not realize there is a problem right away. In cases where an adult child is concerned about an elderly parent’s recent changes in behavior, retirement, illness, or the death of a loved one may serve as a trigger event for substance abuse. Note that in cases where seniors are drinking to excess or abusing prescription medication, the warning signs of addiction are often mistaken for age-related cognitive decline or the early signs of dementia. Since addiction is often mistakenly seen as a younger person’s problem, it’s somewhat easier for seniors to hide the signs of drug and alcohol abuse from the casual observer. If you’re worried about a parent’s substance abuse, discussing your concerns with other family members is a good place to start. You may find that your siblings or your other parent have similar concerns, but were too afraid to speak up until you began the conversation. Joining together to discuss the problem in a calm, rational way will help you decide how to best proceed. Planning an intervention can be an effective way to convince your parent to seek treatment for drug or alcohol addiction. An intervention is a meeting led by concerned family members and friends. The meeting begins by having everyone share examples of behavior that they’ve witnessed and how these actions have negatively affected them. Then, the group presents a prearranged addiction treatment plan and the consequences for refusing to accept treatment. After listening to everyone speak, the addicted person is then asked to make an immediate decision about seeking treatment. If the addicted person refuses to accept treatment, the intervention team must be prepared to follow through on the consequences—which may include limiting contact or refusing to provide financial assistance. Try to avoid using the word “addict” since older people are more likely to view substance abuse as a moral failing instead of a chronic illness. Be supportive and compassionate by taking about happy memories you have with your parent. Stress that your concern is coming from a place of love. Don’t bring up topics that are unrelated to your parent’s substance abuse. Keep your focus on the need to get your parent into addiction treatment. If you believe that your parent may become violent if confronted about his or her substance abuse, do not try to have an intervention without the assistance of a mental health professional. Ensuring the safety of everyone in your family should be your top priority. Having a parent who struggles with addiction is a traumatic experience due to the role reversal it involves. Normally, your parent is the one to care for you, guide you, and teach you how to prepare for the future. When addiction forces you to become your parent’s caretaker, feelings of confusion, anger, shame, and betrayal can result. Seeking counseling can help you learn to deal with your feelings surrounding your parent’s addiction in a constructive manner. Support groups such as Al-Anon or Al-Ateen may also be useful in helping you to better understand the challenges associated with your situation.